In a pan, heat the cup of sugar over low heat until it achieves the consistency of caramel. It takes a while, but don’t leave it unattended and move the pan as it begins to melt. Once it looks like caramel and is melted, decide how dark and strong you want the caramel to be. The lighter the color of the caramel, the lighter flavor. But be careful because if it gets too dark it can taste bitter and can burn quickly. Take it off the heat and pour it into the bottom of a flan or round tube mold or into 10 individual custard cups. Do so quickly, since caramel hardens fast. Place the almonds and remaining sugar into the blender or food processor and finely grind. Add the orange juice, orange zest and blend. Add in the eggs and quince liquor or Grand Marnier and puree until combined. Pour the flan mixture on top of the hardened caramel in the molds. Place the molds in a hot water bath in a deep baking pan. Make sure the water comes up to about half the height of the molds and that the water is very hot. Slide the baking pan with the molds into the oven. Bake 50 to 55 minutes, or until a toothpick inserted in the middle of a flan comes out clean. When ready, take them out of the oven, out of the water bath and allow to cool. If flans will not be eaten on the same day, they can be covered and refrigerated, for up to a week. Before unmolding, you can place the molds in a container with very hot water for 5 to 10 seconds, so that the sugar will melt a bit, and help the flan come out. You can also run the tip of the knife around the rim of the flan. Then turn the flans onto a plate, but wait a bit until most caramel pours on top of each flan. I LOVE LOVE LOVE your show, I have tried many of your recipes and they are absolutely delicious! I am 22 yrs old and watching you cook has really helped me become a better cook . Thank you! 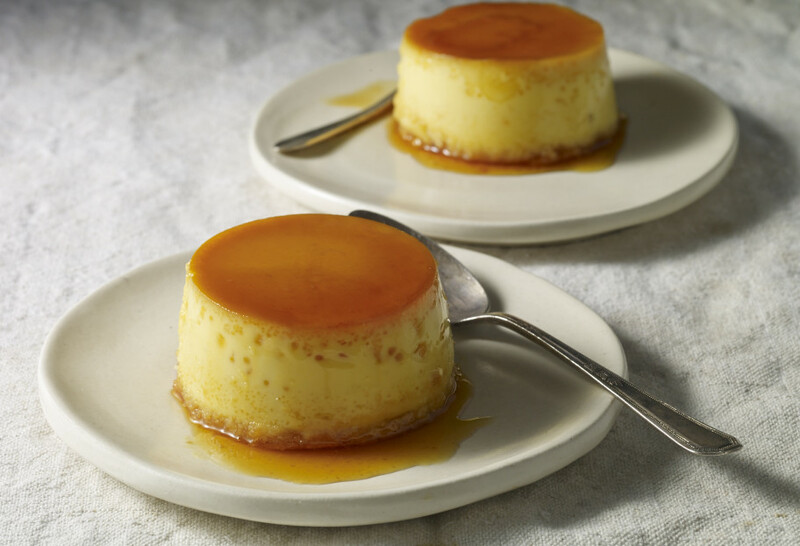 Id love to try your flan recipe but would like to just make plain original flan .Do I only have to exclude the almonds and orange juice from this recipe?